Milk is a vital component of a child’s diet. It provides many important nutrients like protein, calcium, and potassium. Experts agree that for children under one year of age, breast milk is best. From the age of 1 to 2, if a child is no longer breastfed, she or he should drink whole milk and water. After age 2, children need less fat in their diets. Serving lower fat milk is an easy way to reduce fat and keep all the good nutrition provided by milk. Non-fat and low-fat milk (1% or lower) are recommended by the American Academy of Pediatrics for all children over 2 years old. 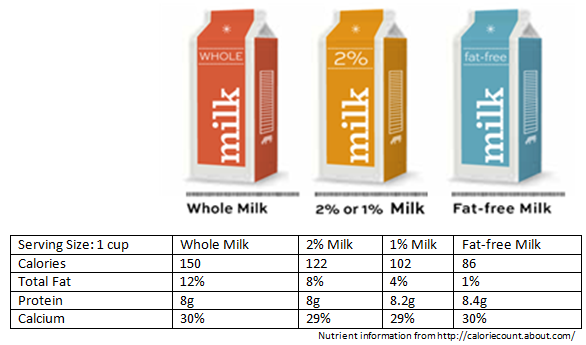 The table below clarifies the nutrient content of 1 serving of milk (1 cup) in four different fat contents (whole, reduced, low-fat, and fat free) with the emphasis on total fat, protein, calcium, and calories. Low-fat milk has the same amount of calcium, protein, vitamins and minerals in comparison to whole milk. It also has less fat and fewer calories than whole milk while keeping the same great taste. 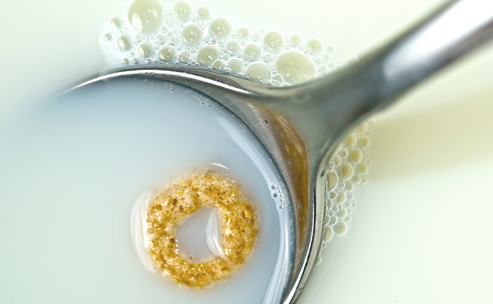 Whole milk is high in saturated fat. Diets with high saturated fat are known to have health implications like raising cholesterol levels and, in turn, increasing one’s risk for coronary heart disease. Hope this helps clarify some of the differences between various types of milk. The short story: for two-year-olds and older provide 1% or non-fat milk. Stay tuned for a blog post on flavored and sweetened milks. Reviewed by: Kitty Lenhart, MEd, RD of Contra Costa Child Care Council and John Muir Health. Thanks Kitty! breastfeeding, milk, Nutrition Facts, partners breastfeeding, childhood obesity, health, healthy beverages, infants, milk, nutrition. permalink.